AIA Maine crowns its winning design. Maine architecture is dead. Long live Maine architecture! These are truly revolutionary times for the state of our state’s architecture—from the new wave of assured and refined residential designs to the renewal and reinvigoration of our urban landscapes. If ever there were restrictions on architectural design in Maine, they have been cast off; today’s architects are limited only by their own vision. While the diversity of contemporary structures is staggering, there is an underlying vernacular that binds together Maine’s myriad architects—it is the language of geography and climate, a bold and positive reaction to our state’s landscape and economy. Every two years, the Maine chapter of the American Institute of Architects (AIA Maine) solicits the best of Maine architecture for a competition aimed at raising the state’s already high standards of design. 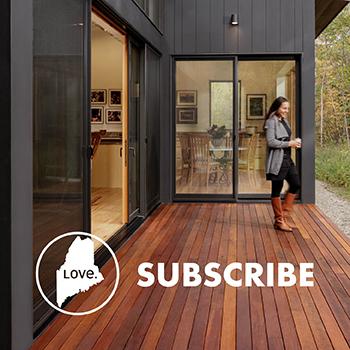 Maine Home+Design is honored to present, for the first time, the winners of the AIA Maine Design Awards 08. From a field of nearly forty entries, the competition’s three jurors—each a nationally prominent peer from outside the state—quickly reached a consensus in selecting this year’s top winner: the House on the Barrens by Elliott Elliott Norelius Architecture in Blue Hill. Sited along the edge of a tree line atop a gently sloping field, the home’s juxtaposition of three distinct yet connected structures evokes the aura of a rambling New England farm in its purest, most elemental form. Bruce Norelius, the partner who oversaw the design with project architect J.T. Loomis, says the homeowner’s support inspired them to progressively pare down the design. “They were really into reduction and never afraid the house would get too simple,” he recalls. Elliott Elliott Norelius Architecture also received awards for Excellence in Architecture from AIA Maine in 1997 and 2001. The format of the AIA Maine Design Awards 08 is simple: projects must be from 2003 or later and executed by architects with their primary office in the state. Both commercial and residential designs are considered, and although the projects do not have to be located in Maine, all of this year’s winners are. The jurors selected four projects to recognize with Honor Awards. Portland’s Congress Street is the main artery at the heart of Maine’s largest city. Over the years, it has seen both boom and bust, decline and rebirth. The AIA Maine Design Awards 08 jurors believe the two projects they selected are significant additions to this important cultural and economic thoroughfare. Architect Patrick Costin led Harriman in designing a new office space for Maine Heart Surgical Associates, just down the hill from Maine Medical Center. Costin transformed an existing utilitarian commercial structure into a beautiful three-story building with a mixed façade of brick, metal, and glowing wood. “It feels like a complete building now—it has been recomposed,” com-pliments Leers, who is a principal at Leers Weinzapfel Associates in Boston. Architect James A. Sterling’s work with 490 Congress Street goes far beyond a renovation—it is nothing short of a reinvention. The building was originally two stories, but now it is five. It was formerly all commercial, yet now it is a mix of commercial and residential. It was once covered in a mix of funky commercial sidings, and now the coated-copper siding makes it stand out from its brick neighbors. The homes selected for Honor Awards share a feature not uncommon in Maine: the coast. In many ways, however, the two designs couldn’t be more dissimilar. While one is tucked away on an isolated island peninsula, the other is located smack in the middle of busy Higgins Beach in Scarborough. For Sam Van Dam, of Portland’s Van Dam Architecture and Design, location was everything when he got down to designing his award-winning project. “That peninsula…” says Van Dam with a wistful tone. “It was such a pleasure to work on that property, and we did our best to save everything we could.” This included making detailed topographical drawings identifying the location of every tree on the property so the natural landscape would remain intact and undisturbed as the home was fit to the site. Conceived as two cabin-like structures perched on pilings and connected by an L-shaped hallway “bridge,” the home is just 24 feet at its widest dimension. “This allows the light to pour in,” says Van Dam. Finished on the exterior with red-cedar shingles and copper roofing, with Douglas fir and southern yellow pine on the interior, the home effortlessly relates to its surroundings. As Whitten Architects began re-imagining an existing cottage on Higgins Beach, Rob Whitten remembers two key words that came to mind: simple and fun. “We knew we were creating for a barefoot world, and we wanted to keep that ‘off-duty’ quality,” says the architect. With architect Kevin Moquin providing the project’s thrust, the home’s handsome, pale-gray exterior and dark, standing-seam metal roof was dotted with bursts of bright red. Inside, hardwood floors are mixed with the occasional whimsical square of red Marmoleum. Beadboard walls and ceilings magnify the “cottage” vibe, while the kitchen’s white tin ceiling is contrasted with stainless-steel counters and lower cupboards. After poring over the submissions to the AIA Maine Design Awards 08, the jurors couldn’t help but note a surprising lack of “overtly green projects.” Yet many of the submissions did incorporate a considerable number of sustainable, environmentally friendly elements; they just didn’t play up these features. “In other parts of the country,” reflects juror David Hingston, “Leadership in Energy and Environmental Design (LEED) components are almost always touted as part of a submission’s presentation.” Hingston, who has practiced in the state, believes that Maine architects don’t need to advertise how “green” they are because designing more intelligently and sustainably has been common practice here since long before LEED. If the AIA Maine Design Awards 08 are indicative of statewide trends, and Maine’s architects are leading the LEED charge, they are doing it with a rare combination of style and humility. Time and again, the jurors for the Maine Design Awards 08 noted that the winning projects were “finely crafted, with a focus on craftsmanship and quality.” For every great design there are countless craftsmen who meticulously execute the architect’s vision. We salute the builders of each project alongside the winning architects. Builder: Langford & Low, Inc.